I just updated since I see we are nearing the beta period so I figured it was bug free/stable enough. In testing I am not getting join suggestions like normal? it would suggest ars.RunNo = ar.RunNo. Now I get no suggestions? Resetting the config did nothing for this. Which database server version is that? I'm unable to reproduce your results. Please try importing factory default configuration. Try a different database to see if it's database or schema specific. Tried another database (that I am not super familiar with or anything) but also did not get join suggestions. Hmm.. Not sure what else to suggest. Maybe a restart would help, clear some caches. To the best of my knowledge nothing changed in that area. re-loaded sql assistant with defaults. A couple things changed when I compare the MSSQL Joins from 7.x and 9.x, but nothing major. There are still couple of things that could be checked. Please check SqlAssist.log file under %APPDATA%\SQL Assistant\9.0 that there ate no exceptions logged. 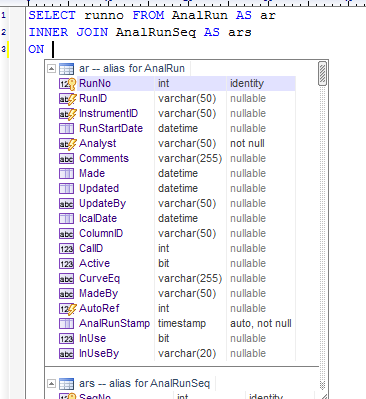 Validate Joins (MSSQL) query in the Options -> DB Options -> DB Queries. It should return some results if you replace :OBJECT_ID with id of your table with foreign keys. this is literally the only thing that changed according to BC4. Hrmm. Ok nothing with the word 'exception' in it in the log. But the second part... might be bingo. But why would it work before? I inherited this DB from previous developers, it was grown from an Access Front end. Referential integrity was done at that time via triggers, there are NO Foreign Keys in the database unless I have added them (and I don't think I've added any/many to avoid confusion). So the question becomes is why did it work before? It used to join on fields with the same name, or like Data Types at the very least. So it did work, previously without PK/FK relationships. 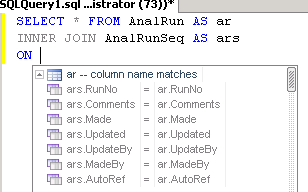 In addition to using referential integrity definitions for JOIN clause suggestions, SQL Assistant can use columnname matches. SQL Assistant uses color-coded styles to distinguish between different suggestion types.